Victorious is the final book in The Lost Fleet series and one of its best. Given the title, it won’t come as a surprise that the book narrates how Jack Geary finally manages to win the war against the Syndics. But Victorious also leaves some mysteries unsolved and a few lose ends that will be explored in the two following series. One of these follow-up series is about the Syndics and the other about the Enigma aliens. 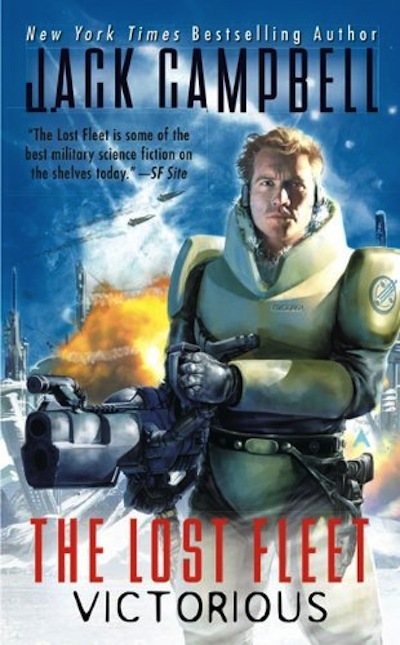 This book begins with Captain Black Jack Geary finally meeting the Alliance Council to report on his historic mission in Syndic space and to make some proposals on how to put an end to the war. As we’ve seen with so many characters in these books, a number of Council members distrust Geary just because he has the power to do evil so they conclude he must intend evil. Some of them want to arrest him but the quick meeting concludes with a promotion to Fleet Admiral and a new mission to return to the Syndic Worlds. The goals now are two: to end the war against the Syndics and to try to prevent one against the Enigma aliens. But Black Jack Geary is very much like Horatio Hornblower: loyal, self-sacrificing, and humble to the point that few understand him. He even tries to avoid being promoted, convinced as he is that he doesn’t deserve it. Compared to trying to deal with Alliance politicians, crushing the Syndics should be a piece of cake, and compared to trying to understand Captain Tanya Desjani, figuring out what the aliens wanted should be easy. The next time he sees Tanya, she has already found another thing to complain about. And it is up to him to solve it, never mind that she is the captain of the fleet flagship. Now that Tanya knows that she has won the big prize by seizing the alpha male of the galaxy for herself, nothing will make her happy. Nietzsche said—repeating a joke from those days—that women were “not even superficial”. In the first five books of the series, Desjani was very much like that: a one-dimensional unconditional supporter of Geary, but now she is chronically unsatisfyable. To compensate, Victoria Rione spends the entire book being nice, reasonable, and even helpful. Surprises: It’s A Trap! Another Death Star! We have already seen how the Syndics turn the jump gates into genocidal weapons. Countless lives have been lost. Irreparable damage done to entire worlds. And there is a very real possibility that this doomsday weapon might be used massively by the Enigma Race against all mankind. Understandably, this is very high in the Geary’s list of concerns. And there have already been a good number of conversations about this. One of the consequences of such conversations has been the development of a “safe-fail mechanism”. Of course, if the owner of the jump gate still wants to use it as a weapon, he can always deactivate the safe-fail. But when halfway through the book the Syndics try this (again!) it takes our heroes another impromptu brainstorming session to realize what is going on. Preventing this type of catastrophe was one of the very reasons why they were sent on this new mission and yet, it takes them by surprise?! Whiskey Tango Foxtrot! I understand that the good guys can’t just jump into the system, notice all the hints that the trap is in place and proceed to deactivate it. That would be anticlimactic. It wouldn’t work because it would spoil all the fun and suspense. But this ultra-naiveté doesn’t work either. After that, the book improves very much. There is plenty of action with the Syndics and the Enigma race complete with hints about things to come in the other series. As I said before, given the title, we know that the book ends well. And we also have good reason to suspect that the protagonist will have more than one reason to smile at the end. After all those troubles and difficulties, the book ends on a not-so-military high note.